Over the weekend, a team of bicyclists beat an airplane from Burbank to Long Beach, California. 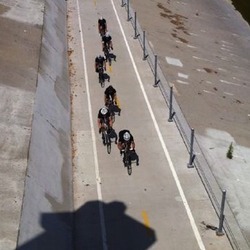 When they set out to prove cycling could be faster than a $4 flight offered by JetBlue, a group called the Wolfpack highlighted the insanity of the situation brought on by our overbuilt, carbon-fueled transportation system. The general opinion around the Streetsblog Network today is that, all in all, it was a pretty good weekend for cycling and for rethinking transportation more generally. All of this begs us to ask a whole bunch of questions about our basic assumption about how we get around in our urban environments. Indeed, even in our car dominated infrastructure, aren’t there better ways to get from point A to point B? Often there are but we are too programmed as a society from birth to expect that we should be able to hop in a 3,000-pound vehicle and drive to the door of the store, our place of employment, etc. Regardless of whether it is three blocks away or three miles away. The past couple of weeks have seen a flurry of media coverage. Public interest has been piqued and people are actually thinking about transportation policy. Is it worth it to shut down the 405 twice to demolish and rebuild a bridge so that we can add a carpool lane in one direction at a cost of about $1 billion? Carmageddon is important on another level too. It reveals how insecure a lot of people feel without unfettered access to the roadway network. Although the 405 opened in the 1960s, it seems as if it’s been a part of Los Angeles since time immemorial. To lose access to it, even for a weekend, is, for many, to have one’s sense of order upended. How will I get around without unfettered access to my roads? Could I really do things like walk to a nearby store? Could I really ride a bike? Could I really ride a train or (gasp) bus? Could I really just stay home and relax instead of driving all over town this weekend? So hooray for the Wolfpack, not just for winning, which we never doubted they would, but for so artfully demonstrating the backwardness of many of our assumptions about transportation. Elsewhere on the Network today: Pattern Cities explores the proliferation of “Pop-Up Cafes” in former parking spots in San Francisco and New York. M-Bike.org explores the slippery definition of Complete Streets in Southeast Michigan. And the Transport Politic studies transit agencies’ options given the likelihood that their federal funding will be greatly reduced in the new transportation bill. Cycling and the Law: Where Does Education Begin?